The Search for Life Is Picking Up Speed! Recently, the search for extraterrestrial life has started to gain significant momentum. NASA has just announced, for instance, that it is setting aside $25 million to develop the scientific instruments needed for a mission to Europa (Figure 1). This is the ice-covered moon of Jupiter that could harbor life in the ocean underneath its icy exterior. Finding any form of life on a solar system body other than Earth -- be it Mars, or one of the satellites Europa, Enceladus, or Titan -- would indeed be very exciting. The true revolution, however, will ensue once we find extrasolar life -- life on a planet orbiting another star. The main reason that makes extrasolar life the much bigger prize is very simple. If extraterrestrial life is found within the solar system, unless it is absolutely clear that it has arisen independent of our lineage, there will always be the possibility that life on Earth and this newly found life had the same origin. The discovery of life in a planetary system around another star, on the other hand, will immediately imply that life is not exceedingly rare, with all the extraordinary biological and cultural implications. Figure 1. 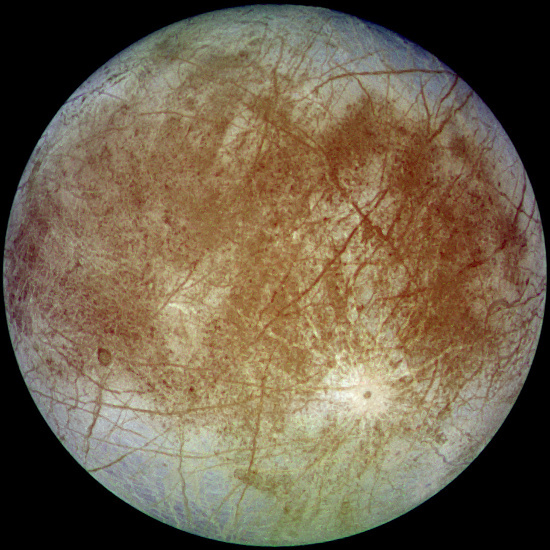 Jupiter's satellite Europa. Image in the public domain. Several factors have combined to advance the search for life to the level of a high-priority quest. First, the statistics of the discoveries by the Kepler space observatory have made it clear that there are billions of planets in our Galaxy that orbit their host stars in the so-called "habitable zone." This is the range of distance that is neither too hot nor too cold, which allows for liquid water (thought to be a necessary ingredient for life) to exist on the planet's surface. Second, the Hubble and Spitzer space telescopes have already demonstrated that they can (at least partially) determine the composition of the atmospheres of extrasolar planets (only gas giants so far). 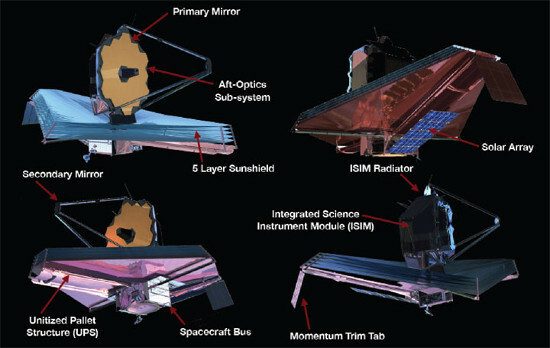 Third, and most important, the upcoming Transiting Exoplanet Survey Satellite (TESS; Figure 2), to be launched in 2017, and the James Webb Space Telescope (JWST; Figure 3), to be launched in 2018, could (at least in principle) discover biosignatures in the atmospheres of Earth-size planets orbiting small (M-dwarf) stars. To constitute an unambiguous detection of life would probably require a combination of potential biosignatures, such as: inferred liquid water, oxygen and ozone, and an atmosphere that exhibits an extreme thermodynamic disequilibrium. To be sure, the chances that TESS and JWST will actually find life are small, but definitely not zero. Figure 2. 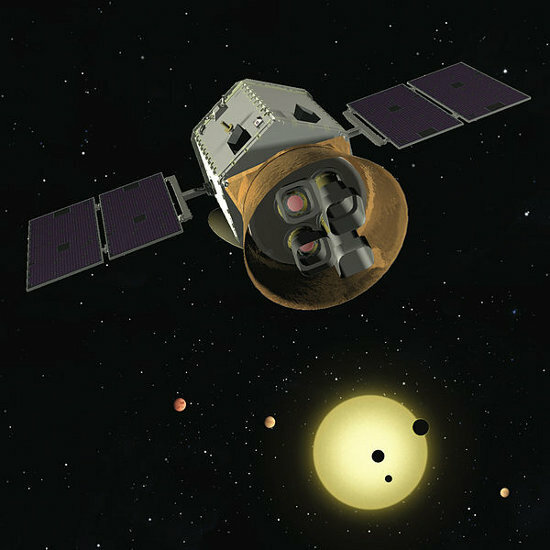 The Transiting Exoplanet Survey Satellite (TESS). Credit: TESS team. Figure 3. The James Webb Space Telescope (JWST). Image in the public domain. The key point is that with the currently upcoming and the proposed telescopes (such as a 16-meter optical-ultraviolet space telescope with the acronym ATLAST), it appears that finding extrasolar life is, for the first time in human history, within reach. A similar optimism seems to be associated with the search for extraterrestrial intelligent life (SETI). In fact, I would venture to state that if extrasolar life is not found within the next thirty years, I would be amazed. Ultimately, what makes the search for extrasolar life one of the most (if not the most) fascinating scientific endeavors, is the fact that you don't have to be a scientist to realize that its discovery would dwarf by comparison even the Copernican and Darwinian revolutions combined!